When Ocarina of Time originally released for the Nintendo 64, one of optional items that you could find in the quest was the Stone of Agony. The stone utilized the Nintendo 64’s Rumble Pak feature, and it caused the controller to shake whenever you came near a secret. In subsequent re-releases of Ocarina of Time, including the Nintendo Wii virtual console release, the Stone of Agony was left in the game. However, it was rendered useless due to the lack of a rumble feature. In Ocarina of Time 3D, the game has been upgraded and no longer includes the Stone of Agony. In its place, Ocarina of Time 3D will have the Shard of Agony. It is presumed that you will get the Shard of Agony in place of the Stone of Agony after collecting 20 Gold Skulltulas. Instead of giving clues in the form of a rumble, clues will now be given in an audio and visual sense. 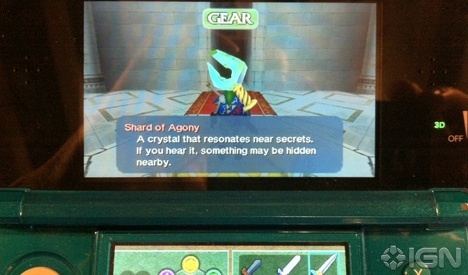 Whenever Link comes near an area with a secret, a pinging sound will play, and a small icon of the shard will flash at the upper-left part of the screen. Unfortunately, I did not get a hands on with the Shard of Agony as it wasn’t in the playable demo last week. However, it does look like Grezzo and Nintendo did a great job in modernizing an outdated feature from Ocarina of Time. While I assume it will basically have all of the same functionality as the Stone of Agony, it’s nice to see that this small feature is not skipped over. Even this tiny change will be a bit of fresh air as it is yet another change from the Nintendo 64 version of Ocarina of Time. Ocarina of Time 3D is set for release on June 19th here in the United States. While still a month away, the hype for the release is well underway with a constant flow of news and media pertaining to its release. Be sure to stay tuned here at Zelda Dungeon for all the latest on the Nintendo 3DS title. Until then, be sure to post your thoughts in the comments below.